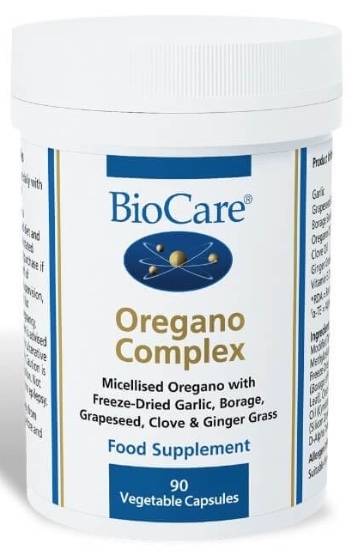 BioCare Oregano Complex health supplement is a combination of food grade oils freeze-dried to water-soluble compounds to promote absorption & bio-availability. Oregano Complex provides a multi-systemic and broad spectrum activity in a single capsule. Oregano Complex is a combination of concentrated food grade oils. These oils have been freeze-dried and micellised to water-soluble compounds to promote absorption and bioavailability. Caprylic acid (e.g. 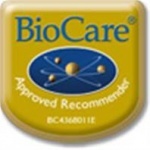 BioCare Mycropryl) is a short chain fatty acid found in human breast milk and coconuts that has been found to help establish the growth of beneficial bacteria in the gut. Calcium and magnesium caprylate favour the growth of the lactic acid bacteria in the gastrointestinal tract. Oxygen has antiseptic qualities and is antagonistic to yeast organisms such as Candida Albicans. Double bonded oxygen has antibacterial and antifungal properties. Grapefruit Seed Extract has antiparasitic, antibacterial and antifungal properties, and helps to maintain the correct balance of intestinal flora. Other herbs containing antifungal properties include Pau d’Arco tea and goldenseal. Probiotics such as L.acidophilus and B.bifidum help reduce the proliferation of yeast organisms such as Candida Albicans. L.acidophilus helps reduce the colonisation of unfriendly bacteria by producing natural antibiotic substances on the intestinal wall. Oregano Complex capsules should not be opened or chewed. Oregano Complex is not suitable for use in pregnancy or if pregnancy is being planned. Not suitable for individuals with gastritis, colitis or ulcerative conditions of the stomach or colon. Not suitable for individuals taking anti-blood clotting drugs such as Warfarin, Coumarin and Heparin.